obamapoint0339, originally uploaded by Watts4. Fellow North Carolinians, the time has come to place your vote, and I'm expecting better results from us than those smarty-pants folks in CA, NY, PA, OH, etc. Yesterday after church, an older man came up to me and said he had seen me on Monday. At first, I thought he must have seen me driving around town or something. But this gentleman had seen me at the Obama rally. He had waited in those long lines because he thinks Obama is the best chance we've ever had to make a difference. He thinks Obama is the one person who can best deal with the folks in the Middle East. He thinks Obama can make America great again. And I couldn't agree with him more. 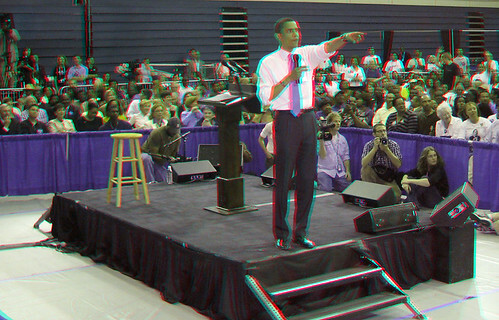 I gave him some 3D glasses and some pictures from the rally, and implored him to go vote on Tuesday. His response: "I already have". So fellow North Carolinians, I implore you, go vote tomorrow, and vote for a real change. Update: Not soon after I posted this, that older gentleman just stopped by our house and dropped off a big bucket of fresh strawberries, from his farm. Found out he took his grandson (who I've played ball with) to the rally. Gotta love NC! Eight Belles, the only filly in the Kentucky Derby, had to be euthanized on the track. "Tragedy struck the first filly in the Kentucky Derby since 1999, as Eight Belles went down on the track after her second-place finish today, broke two ankles, and was euthanized. ... Eight Belles' trainer, Larry Jones, returned the love. "It looks like it could be the year for the girls," he said. "Eight Belles I’m sure would want to endorse."" "It is virtually impossible to overstate the profligacy of what our government spends on the military. The Department of Defense's planned expenditures for the fiscal year 2008 are larger than all other nations' military budgets combined. The supplementary budget to pay for the current wars in Iraq and Afghanistan, not part of the official defense budget, is itself larger than the combined military budgets of Russia and China. Defense-related spending for fiscal 2008 will exceed $1 trillion for the first time in history. The U.S. has become the largest single seller of arms and munitions to other nations on Earth. Leaving out President Bush's two on-going wars, defense spending has doubled since the mid-1990s. The defense budget for fiscal 2008 is the largest since the second world war. Before we try to break down and analyze this gargantuan sum, there is one important caveat. Figures on defense spending are notoriously unreliable. The numbers released by the Congressional Reference Service and the Congressional Budget Office do not agree with each other. Robert Higgs, senior fellow for political economy at the Independent Institute, says: "A well-founded rule of thumb is to take the Pentagon's (always well publicized) basic budget total and double it."" Only so many places we can cut, and we need to make cuts. Our military spending is hurting us in the pocketbook (not to mention the immorality of the Iraq invasion/occupation, or the fact that it has actually worked against our national interest, making us less safe). Time to regroup.